There is an entire world beyond slotted and Phillips head screws. 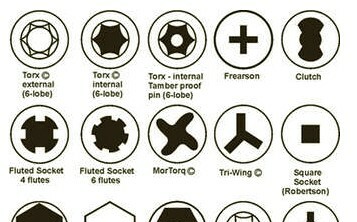 Learn your screw types and a whole lot more about the history of screws. For each screw drive type, from ancient Slot through to space-age Lox we present a quick view of the screw head, the drive name, a picture of the appropriate drive bit, followed by an explanation of the type. Also presented are the advantages and disadvantages of each drive type. Never find yourself peeling back the warranty sticker on an electronic device again and exclaiming "What the hell is that!" when confronted with an exotic screw type.